Unlike the current-gen gaming systems we've posted deals on, there's no bargain basement Wii U to grab this Black Friday, a bummer since Super Mario 3D World is definitely a must play. However, we've got a few solid options for you. Not some huge discount but you're getting a Zelda game and a limited edition console. Comes with New Super Mario Bros. U and Super Luigi U. 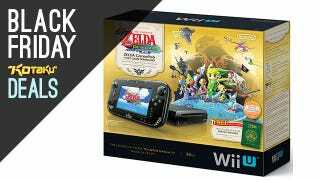 For $20 more than the regular price of this bundle, you also get NintendoLand and a Mario Wiimote thrown in. Also available with a Luigi Wiimote instead.